Most vehicles. Not valid with any other offer. A printed coupon must be presented at time of write up. Plus tax & shop supplies. No further discounts apply. See dealer for full details. Only valid for Leesburg Volkswagen. Limit 1 per house hold. Expires 4/30/19. My experience at Jenkins Volkswagen in Leesburg was excellent! Sheriff Lowe was our Sales Rep. for both our vehicles. She was very friendly, helpful, Knowledgeable and honest! My husband leased a 2017 Jetta and I purchased a 2017 Tiguan. She and her Sales Manager worked with us on my trade and gave us a great deal on Our "new" vehicle. Throughout the process, we did not feel rushed at all!! We are so happy with our purchase and lease! Great service. Timely and affordable. Won't try to sell you services you don't need. Chris the internet manager did a great job finding the exact vehicle I wanted. He explained everything in detail, and the financing went smoothly after a small hiccup. November 2017. I did not go to Jenkins to get a new vehicle, but went home with one. Mark Elliott is my go to guy. He knew I wanted to get back in a Tiguan which I did not think was possible, but he made it happen. We are both so happy with our new vehicle and want to thank Mark for making it happen. Definitely like Jenkins due to Mark. Good service. Work done well. Phyllis, Service Manager, handled the visit perfectly. Thank you all. The service was done quickly and they washed the car. They treated us like family and gave us the best car buying experience ever! I love my new Passat! Thanks for taking such great care of us. Gina Kotara took care of me like I was her only customer which I knew I wasn't. She went above and beyond. Her communication was spot on. Quick to respond. She knew her job. She will be my go to person. Thank you Gina, it was a pleasure working with you. Sheriff Lowe was amazing. Personal, professional...Easiest car buying experience ever! Go and see her...You’ll be glad you did! Thank you, Sheriff & Team! Awesome dealership. Such a pleasurable, personal, and professional car buying experience! Our salesperson, Sheriff Lowe, was amazing. Sales Manager Kenny Hunter and Finance Manager Chester Anderson were also excellent!!! I unreservedly recommend Sheriff and Leesburg (Jenkins) Volkswagen. Go see them and get a fair price, professional service, and drive away with a new car today! You’ll be glad you did! The best car buying experience I have ever had. This is was the most comfortable and easiest car deal I have ever done! 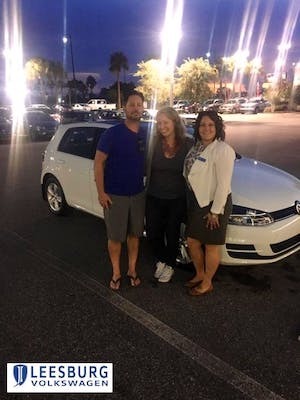 I got a VW Passat at Jenkins and Mark Elliott was so good at keeping my nerves at bay, and working with my preapproval it felt like I was working with my family instead of a business. Truly a great transaction, I have had two cars from them personally, and will continue to do so in the future! Chris was so personable. I felt so at ease working with him. A dreaded experience was complete pleasurable because of his personality. Thanks Chris. Plus my dream car was bought! 2010 Beetle Convertable. Pecfect car for my lifestyle. Many Blessings Chris. 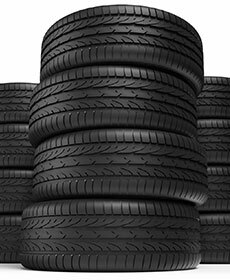 My tires were low and they also checked all the car liquids. Very courteous. My wife and I were looking for a special car, VW did not make many of the car color and interior combination. 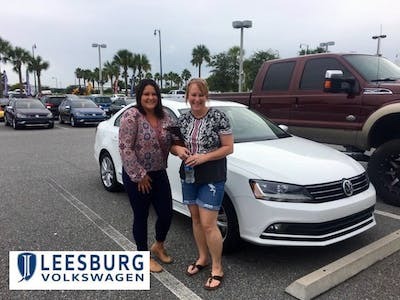 Leesburg VW had it and our sales person, Chris Mealor went above and beyond to deliver the car we wanted at the monthly payment that worked in our budget. This dealership is A+. Leesburg Volkswagen (Jenkins) had the Atlas my wife & I wanted and fortunately we had the right salesperson to assist us; Mark Elliott was patient and wonderfully without pressure. He allowed his product to speak for him. 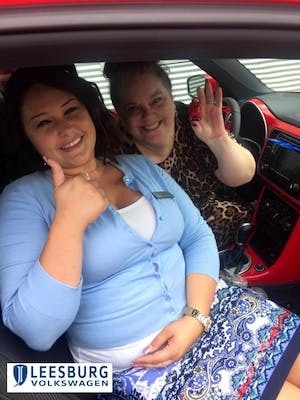 Melanie made sure we were comfortable during our wait & made sure we were happy with the work on our car that was needed. Always great to get to visit with our sales person John Krane who checked to make sure that we were getting everything we needed. If a person has to wait somewhere Jenkins is the best Car dealership in this area. I was extremely pleased with the dealership and my consultant Chris Mealor. I would recommend Chris and the dealership if you are looking to purchase or lease a new Volkswagen. Sheriff Lowe deserves all 10's. Her hospitality was superb! The whole car shopping divergence wa5d awesome..The white Jenkins team made me feel line family. Sheriff was great! She answered all my questions quickly and promptly. Everyome there was friendly and helpful, it was definitely worth the drive from Jacksonville. Thank you! WOW, WHAT A FUN TIME I HAD GETTING MY NEW RED BEETLE (aka "Thriller") WITH SHERIFF. SHE WAS JUST A DELIGHT, I COULD NOT BE HAPPIER !!!! SHERIFF WAS JUST FABULOUS, SO SMART, SWEET AND MADE THIS A REALLY FUN THING !!!! Was at Jenkins vw for the buy back on my TDI. I really hated to get rid of it but the deal was to good. I have been searching for a replacement and nothing really fit. Hadn't planned on buying yesterday but it just so happened they had a Mazda CX-9. I hadn't really thought about one but decided to test drive. It was an awesome suv. Just bought a truck from them. They are very helpful. Gave us a great deal. Sheriff and Kenny were amazing! Best dealership we've worked with. Gina was exeptional amazing ! She took care about every detail on my concearn with my car even after I leave from service when they fix my car a little problem came again and this maintnance team worked amazing explaining everything with detail to cover everything and made you understand without further questions ! Outstanding Team ! Sheriff Howe! She was a God send. She was great and help me and my wife tremendously. Highly recommend her to anyone thats looking to purchase a new vehicle. Very pleasant people to work with. Service was accomplished quickly. Greeted as soon as I almost got to door by Mark Elliot just went in for an estimate was just shopping around 5 minutes later was buying a car (inside joke). Overall great experience. I do love my car. Very friendly staff; car was taken on time and delivered back to me washed and work performed before promised time. Thorough explanation of work needed...will definitely be back again and will be leasing my next car with Jenkins! Mark was very friendly and very intuitive to the type of car needs that I had. He was very informative about the different type of vehicles and did not waste my time in showing me vehicles that I didn't need to see. He demonstrated all qualities of each vehicle that I test drove and I was sold. I was scouring the internet for a car that would meet my growing family's needs as well as providing a little bit of a upgrade to our existing vehicle. The only vehicle that met all of our criteria (price, features, color, etc.) was here at Jenkins Volkswagen. Let me also mention that we live out-of-state...seven hours away. As a Logistician supervisor for the DoD, my job entails foreseeing problems before they exist. Right off the bat I knew that this was going to be a logistical challenge. Mark Elliott was excellent! Very cordial and thorough, answered all my questions. I would highly recommend this dealership and Mark specifically! Mark was great start to finish. Very knowledgeable about the new vehicle and had an answer for any questions . Stand up guy with your best interest in mind the whole time . Really the whole team was great. Chester was awesome with financial and Austin helped get the car ready for us . Definitely will give my highest recommendation to Mark Elliot and the rest of the Team at Leesburg Volkswagen. Thanks so much your teamwork is impeccable. Friendly staff. Worked with Sheriff, Scott, Chester. They really worked with me to get my new car. I would deal with them again. Overall great experience. Sales staff very friendly. Nice selection. Sheriff and Navar are awesome sales people. Representative was very knowledgeable and answered all our questions. Allowed us time to carefully consider our decision. I will feel comfortable when I move forth in purchasing my first Volkswagen Beetle. I would only suggest that vehicle booklets be more readily available. David in your service department is a true people person and he represents your company and the brand well. I live closer to Ocala but prefer your shop as it is simply better. My little Sunshine (a yellow VW Bug convertible) is in excellent hands being serviced and cared for at Leesburg VW. I couldn't be happier!! I stopped by on the 4th of July and worked with Sheriff Lowe. 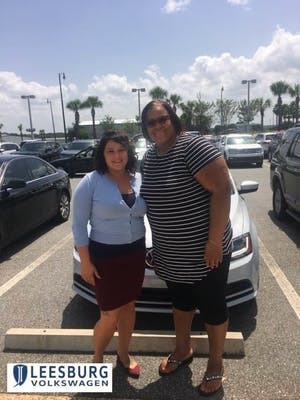 She is a wonderful salesperson and I had a great experience working with her and her team at Jenkins Volkswagen. Sheriff made it an easy and painless process...I will definitely purchase my next vehicle from here as well. I live in Ocala but drive down an hour to Leesburg because service is that much better. Dave over at the service department is great. Mike always is excellent on follow through and making sure the repairs are completely completed as expected.